Our story begins as we travelled from Melbourne, to Fairbanks Alaska, on our second attempt for a trip of a lifetime as our previous trip went horribly wrong. We were lucky enough to see the northern lights and a large mixture of the wildlife while there. We then flew to Vancouver, Canada, and spent a few days traveling around the local area. We traveled through Stanley Park and a day trip to Whistler. After three days, it was time to say goodbye to the Vancouver area and move on to the biggest part of the trip, which was to go and travel on the famous ‘Rocky Mountaineer’. 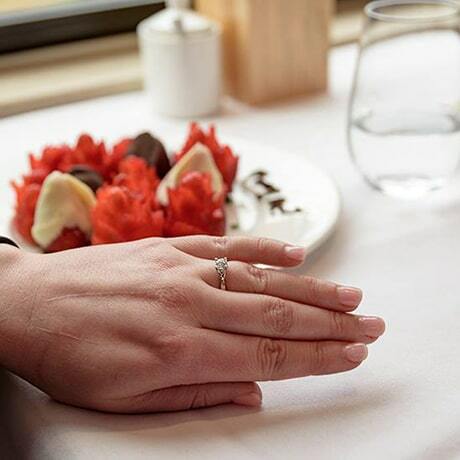 Near the end of day one of our two day trip on the Rocky Mountaineer, I spoke to one of the staff members, Ben, and informed him I wanted to propose to Rebecca on the train. I knew I would on this trip, and was waiting to see when it felt right. This train trip was amazing, so we got the ball rolling and stated setting things up for a special lunch on the second day. 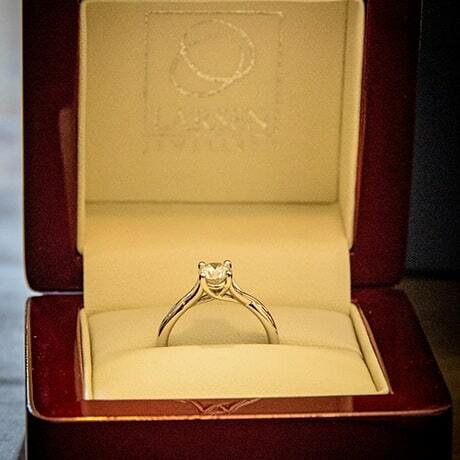 The staff members were full of helpful ideas to make this a very memorable moment for both of us. We then arrived for the night in Kamloops, had a nice meal and looked around the town, and headed off to the hotel for the night. We boarded the train on the second day and took off towards Banff. Ben and I got a moment alone to discuss the final ideas. By this point we knew what was going to happen. We were going to have our own spot, reserved in the downstairs dining room, a quiet corner, and we were going to be served last so we would be there at the end of lunch by ourselves. We both enjoyed a three course lunch and drinks while traveling towards the Rocky Mountain National Park; the views were unforgettable & mind blowing. 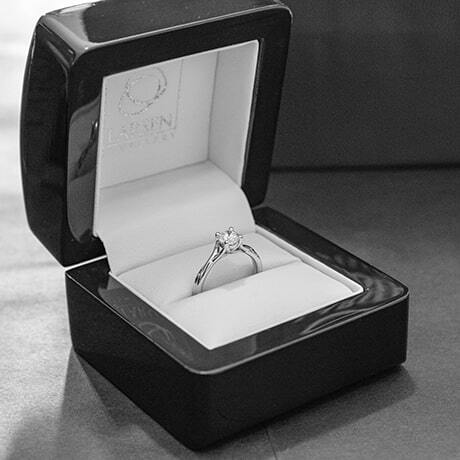 We listened to music that I had picked out to help with the special moment. As the other guests started to head upstairs from the dining area after lunch, we got another round of drinks and continued to chat. After the last guests had left, I was able to give the nod to one of the staff members, who got the ball rolling for the biggest moment in my life. After a few moments, staff brought out some champagne and we had a drink, taking a few minutes to take it all in. While all this was going on, Rocky staff upstairs were filling all the other passengers in on what was going on down stairs in the dining area. After Bec recomposed herself, we started to head towards the stairs and she said, ”I’m glad you did this in private as I wouldn’t want this in front everyone.” I didn’t know what to say, as the next part was about to unfold. As we entered the glass viewing dome and headed to our seats, we could hear the normal commentary going over the P.A. system and then Ben made a announcement as we entered saying she had said yes. 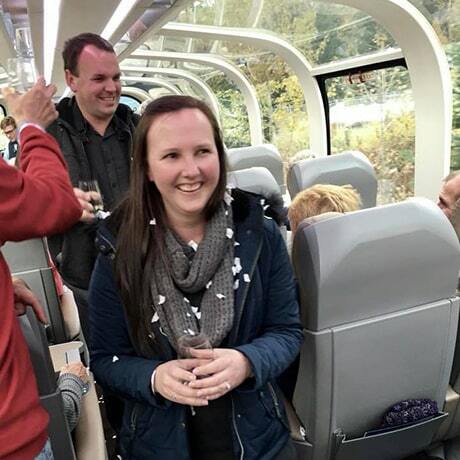 All the passengers had been given napkins to rip up into confetti and champagne for another toast. As we headed to the front it was like it was snowing, with the confetti going everywhere. As we got to the front, we were told to turn around, and the passengers in the carriage behind us had also made a banner wishing us congratulations. 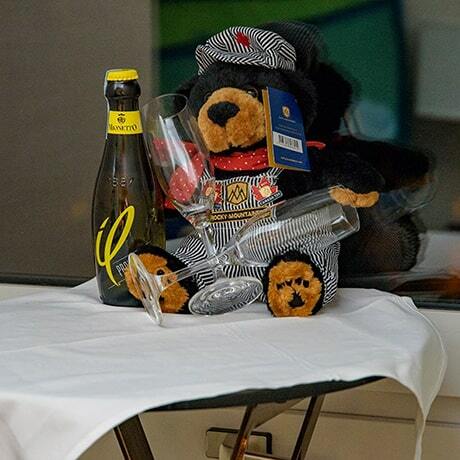 After all the passengers inspecting the ring, we were able to get a moment back at our seats were we found a Rocky Mountaineer teddy bear, necklace and a copy of their book, ‘Through the Clouds’, which all the staff members had signed and written personal notes in. 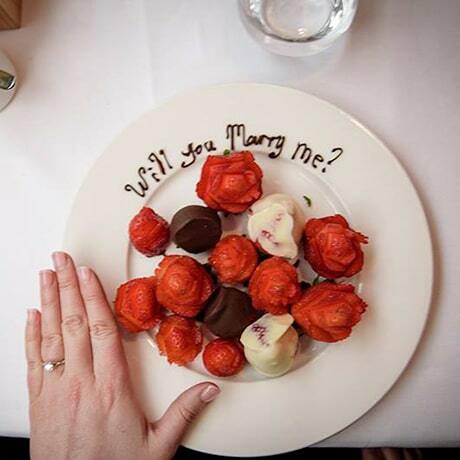 It was a very special surprise for both of us. 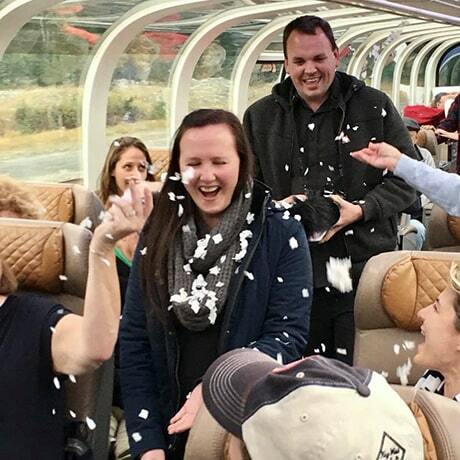 The staff on the Rocky Mountaineer exceeded all expectations and made this an unforgettable experience.